An online service that allows you to easily create time lapse videos using a surveillance IP camera. 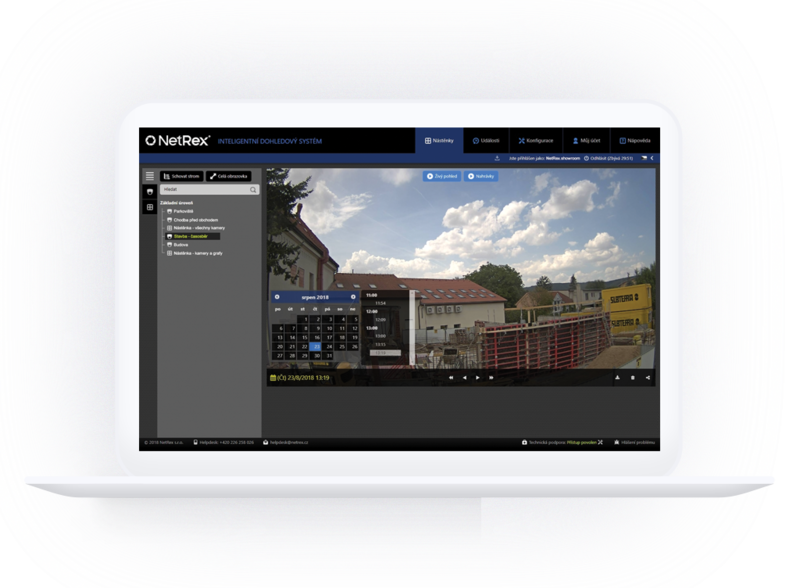 NetRex TimeLapse is an on-ine service that allows you to easily create time lapse videos using a dedicated IP camera. It regularly uploads and sends snapshots of the site to the central NetRex servers, where they are prepared for further processing. NetRex TimeLapse is the ideal tool for perfect promotion and dispute resolution. Presents in the form of time-lapse videos and thanks to this live view, you can easily communicate with partners and other employees. Notwithstanding the fact that you can discover the various mistakes and problems of your business from the snapshots you have taken, saving you a lot of money. Thanks to this, NetRex TimeLapse is a particularly ideal service for construction sites. It will bring your building closer to your employees, investors and customers from the foundation-laying to its completion. Efficient course of construction in minutes! NetRex TimeLapse offers a variety of options to use. Bet on an image that says more than 1,000 words. Perfect presentation of the project on your website. Allow visitors to browse through images or present your project progress by embedding videos from the YouTube channel. Rely on a presentation that will attract your visitors. 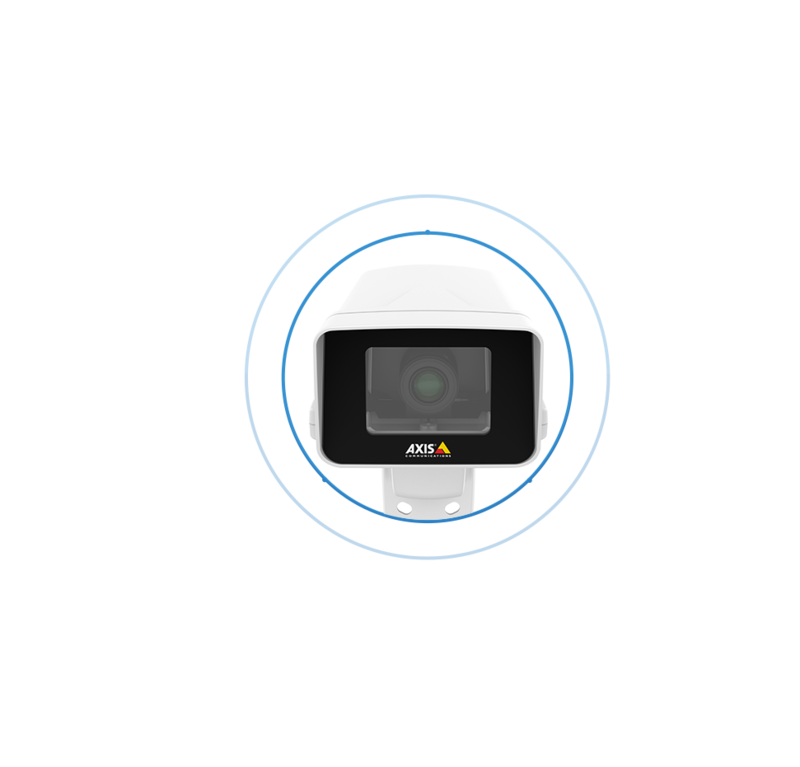 The high-quality Axis IP cameras offer a perfect image with up to 20 megapixel resolution and provide the optimal solution even for the most demanding installations. Desire for actual quality. NetRex TimeLapse allows you to set up regular images at intervals from 5 minutes to 24 hours. At the same time, you can select a specific date and time when you want the images to be taken. Simply and quickly record everything you need! Using the SD card as a cache is an invaluable feature that will keep your data stored even when the Internet crashes. All data will be stored on the SD card until it can be sent to the central NetRex platform. You don’t have to wait even a minute! The advanced interface allows you to quickly browse, download and delete your captured images, and export time lapse videos from the images for the selected period. At the same time, you can work with images in an environment you know - in any web browser. Work efficiently. One-time video exports as well as automated periodicals on a daily, weekly or monthly basis. Create videos for regular meetings or present the progress of the project for the previous month with pictures from working hours. A quick solution that will not hamper you. 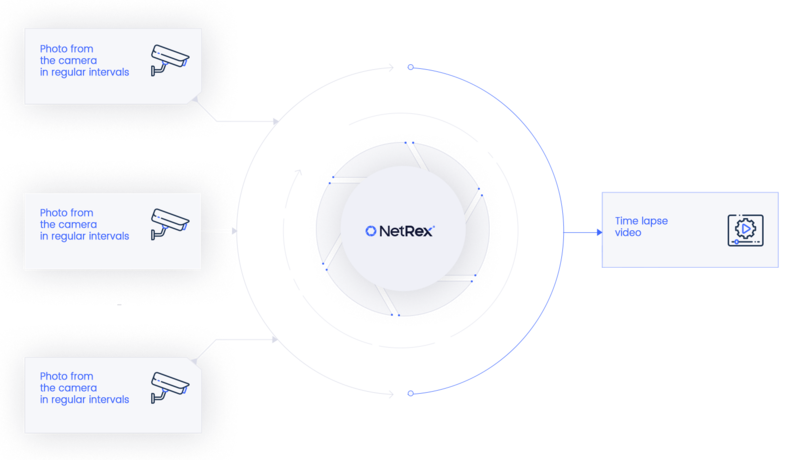 When using a rotating IP camera, the NetRex TimeLapse cloud service allows you to capture images from individual camera positions. With one camera, you can create multiple different time-lapse videos that captures your audience. One single camera for multiple videos. Encrypted access, data transfers and automatic detection of all events. This is complete control over the entire system in which your data will be safe. Ask for maximum safety, which is a priority for us. We will give it to you. Subordinate user accounts with detailed logging of their activities. Thanks to this, also employees can access your cameras, but you will still be in control. Keep everything under control! The system constantly monitors the functionality of cameras, recording processes and other services. In case of problems, you are immediately notified via an application, e-mail or Push notifications to mobile devices. By linking to the central platform, we will solve most problems remotely and save costs on your and our technicians. We will take care of the central checking of functionality!